Craps has evolved to become one of the most popular casino games played across the world. It is fast-paced and offers the chance for players to win sizeable amounts of money with one roll of the dice. Today, the game can be played both online (powered by random number generators) and within land-based casinos. All land based casinos in Australia have a craps table, but we recommend playing the game online first, to get a solid grip on how to play before venturing in to your local gambling establishment. All of the sites listed above have been verified as secure and offer a range of table games including craps. Craps equipment at land-based casinos. To play craps, the bare minimum required is a pair of dice. Because that’s really all you need to play, ‘street craps’ is a common form of unregulated gambling. Within a casino, an oval-shaped table displays the various betting options a player can make (bets, their positions and their payouts can vary from casino to casino). 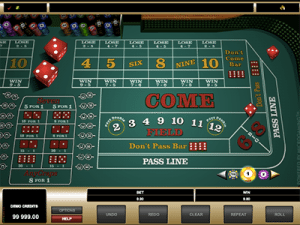 In a land-based casino, the craps table betting layout is mirrored on the left and right side, so a maximum amount of players can stand around the entire table and place their necessary bets. In the middle of the mirrored layout is an area for ‘prop’ (proposition) bets – this section is utilised by players from both sides and encompasses the more novel wagers with very long odds and large payouts (exotic bets which don’t directly affect the outcome of any other bets and which add some always welcome spice to the average game). Online, the betting layout is only present due to the Random Number Generator software and since you are the only one playing at the table – hundreds of players can be playing the casino game but you won’t know it. The rules of craps can seem convoluted for a beginner, so many punters who have never played before avoid the game altogether. 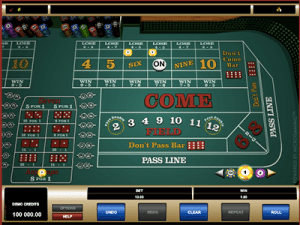 However, with a short but thorough run-down of craps betting instructions, you will be able to learn how to play quickly, and it is certainly a rewarding experience once you understand the basic rules. How to make the pass line bet on Microgaming’s craps title. If a total of 7 or 11 is rolled, the pass line bet wins. If a total of 2, 3 or 12 is rolled, the pass line bet loses. If any other total is rolled, that number becomes the ‘point’. When a ‘point’ is established, the shooter will roll until either the ‘point’ is rolled again, or until a total of seven is rolled (this is considered the second round after the first come-out roll round). If the ‘point’ comes up before a seven, pass line bets win. If a seven comes up before the ‘point’, pass line bets lose. In the above scenarios, when the pass line bet wins, the don’t pass line bets loses, and vice versa. There is one exception to this rule, and that is if a 12 is rolled on the ‘come-out’ roll, pass line bets lose, while don’t pass line bets are pushed (tie, so wagers are neither won nor lost). Winning the pass or don’t pass bet always pays out even money (1:1).The ‘come-out’ roll is the first roll that starts the round of betting. If a point is established on the come-out roll, the dealer will flip over a button which currently reads ‘off’ to the ‘on’ side, and move it to the point number. A new round begins as soon as the shooter either hits the point value, or ‘sevens out’, and we continue on our merry way. Now that you understand the pass line and don’t pass line bets, it is important to understand taking and laying odds, as well as the come and don’t come wagers. Once you are adept with those rules, you are well on your way to joining any craps table within a casino. Playing online is also a great way to establish some confidence first, too, as you aren’t surrounded by any other watchful players. Register an account at Royal Vegas Casino and enjoy Microgaming’s most popular craps title (link). Taking the odds bet on the craps table. If the point is 4 or 10, and either of these totals come up before a seven, you are paid 2 to 1. If the point is 5 or 9, and either of these totals come up before a seven, you are paid 3 to 2. If the point is 6 or 8, and either of these totals come up before a seven, you are paid 6 to 5. If the point is 4 or 10, and a seven is rolled prior to the point, you are paid 1 to 2 (lay two units to be paid out one unit). If the point is 5 or 9, and a seven is rolled prior to the point, you are paid 2 to 3 (lay three units to be paid out two units). If the point is 6 or 8, and a seven is rolled prior to the point, you are paid 5 to 6 (lay six units to be paid out five units). The reason why you must lay more units when laying odds is a seven is more likely to be rolled than the point number, so you must sacrifice a bit more for the shorter odds. In order to take or lay odds, you place your bet behind the pass line. If you have a pending pass line wager, and a point is established, you can only take odds. If you have a pending don’t pass line wager, and a point is established, you can only lay odds. Rolling a seven in craps. The come and don’t come bets are exactly like the pass line and don’t pass line bets, but such bets must be made at any time except for before the come-out roll (as that would default to a pass or don’t pass wager). The come and don’t come wagers are thus helpful for players arriving at the table after a point has already been established. The come or don’t come bet can be thought of as starting an entirely new pass or don’t pass line bet, exclusive to the player making that wager. A come bet wins if a 7 or 11 is rolled in the first round. It loses if a 2, 3 or 12 is rolled. A don’t come bet wins if a 2 or 3 is rolled in the first round. It pushes if a 12 is rolled. It loses if a 7 or 11 is rolled. If the player rolls a 4, 5, 6, 8, 9, or 10, the come or don’t come wager now has a point established for it. Just like with a pass or don’t pass bet, the player is now allowed to take odds (for a come wager) or lay odds (for a don’t come wager). The come bet and any odds taken now win if the shooter rolls the newly-established come-bet point before a seven. The come bet and any odds taken now lose if the shooter rolls a seven prior to rolling the newly established come-bet point. The don’t come bet and any odds laid now win if the shooter rolls a seven prior to rolling the come-bet point. The don’t come bet and any odds laid now lose if the shooter rolls the come-bet point before a seven. Winning come and winning don’t come wagers are paid the same as winning pass and winning don’t pass bets – even money (1:1) for the original bet and the true odds for the odds taken/laid. Any craps bet on Microgaming’s online variant. Any Craps – A wager on the next roll being a total of two, three, or 12. Bar 12 – A wager that if a 12 is rolled, a tie occurs. Big 6 – The player bets that a six will come up before a seven is rolled. Big 8 – The player bets that an eight will come up before a seven is rolled. Boxcars – A bet made on a 12 consisting of two sixes. Come Bet – A bet made after the come out roll on the point being made. Come Out Roll – This is the first roll that kicks off a round of betting. Craps – Within the game of craps, it is a bet that a two, three or twelve will come out on a roll. Crap Out – This is a roll of craps (see previous term) on the come out roll. Don’t Pass – This happens when is craps is rolled on the first roll, or when the point isn’t made before a seven occurs. Hard Way – This is a two dice total that signifies both die are the same number, and can only happen on the total for even numbers. For instance, a hard six is composed of two threes. A hard eight is composed of two fours and so on. Line Bet – A wager placed on the Pass or Don’t Pass line. Marker Puck – This is a device used by the croupier to signify the point number. Pass Bet – A bet that a point will occur, or a seven or 11 will be rolled on the come out roll. Seven Out – A seven is rolled before the point number. Craps dates back to the Roman Empire era. There is evidence to suggest variants of craps date back to the Roman Empire where Roman soldiers would shave pig knuckles down to the shape of cubes to create a primitive form of dice. Markings on each side of these cubes were engraved and the soldiers would toss them into their inverted shields, and place wagers on the outcomes of the throws. This is also where the term ‘rolling bones’ comes from. By the 1700s, the game of craps had come all the way to the new world to the French colony of Acadia. It was in 1755 that the French lost Acadia, and the Acadians then relocated to what is now modern day Louisiana. From there, the name crabes was forgotten about, and the term became either crebs or creps. In 1843, the English in America started calling the game craps, and by 1885, there were myriad terms to describe what we know today as craps: craps-game, craps-table, and craps-shooter among the list. Today, the game is played in casinos and online all over the world. 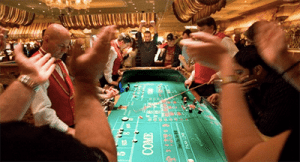 Craps can be played by anyone – it essentially just involves shooting dice down a table and hoping for a certain outcome, or hoping a certain outcome won’t happen. On the other hand, the rules of craps can appear pretty convoluted for a beginner. Craps is a game offering relatively low minimum bets and thus is largely accessible for both low and hi stakes players. It also offers the best odds in terms of a player’s chances of winning over the casino’s chances of winning. This simply means that within the game of craps, there are several bets a player can make that provide zero casino edge. This aspect of the game makes it quite different from just about every other casino game in existence. Give craps and other table games a go in instant-play mode at Raging Bull Casino, our top-rated casino site for players from United States.